Most of the equipment and supplies used for do-it-yourself projects and general sewing can be used to sew handbags. Some extra tools are needed, but none are expensive and the use of them will ensure the success of your project and simplify each step of the process. The Even Feed foot “walks” over fabric to assist with keeping fabric layers feeding at the same rate. 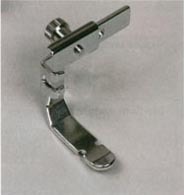 With this foot attachment, fabric can be sewn without shifting or puckering since the fabric is gripped and fed by both upper and lower feed teeth. It feeds well with materials such as vinyl or leather or whenever matching plaids and checks. It is also often used in quilting when sewing two layers of fabric and one of batting. 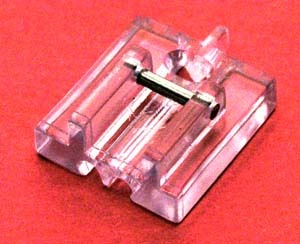 Roller Foot (aka roller guide) for leather, suede, synthetics for more control and less friction. Perfect for all sewers and DIY-ers when you need to feed the fabrics or layers perfectly. Used to evenly feed fabric through your machine. Handles napped or slippery fabrics such as plastics, leather, velvet, vinyl, velveteen, corduroy etc. with ease. The metal roller will not imprint the fabric. This foot is mo lded of a special resin for easy sewing of fabrics that might stick to a metal foot such as Ultrasuede®, faux suede, vinyl, imitation leather etc. 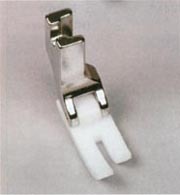 A similar presser foot is a Teflon® foot. A coating of super smooth Teflon® on the sole of this foot makes it glide over leathers, rubbery fabrics or anything else that gives a metal foot a hard time. A self-adhesive Teflon® sheet, available at sewing notion suppliers and by mail order, can be cut to size and applied to any presser foot as well. This foot is indispensable when making garments that require flat felled seams for a clean finish inside and out. The foot neatly turns the raw edge under at a consistent width. Two widths are available to choose from: 4 mm and 6 mm. wide. Allows for a clean finish of construction seams inside and out. The zipper foot is adjustable from left to right so the needle can stitch very close to the zipper. But that isn’t the only use of this versatile foot. Use the Zipper Foot whenever you need a seam very close to the edge of fabric, like when creating your own cording or applying piping. 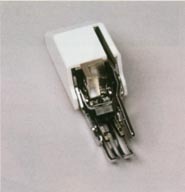 An invisible zipper foot come with assorted shanks to adapt to various machine models. Also, check with your machine dealer for a brand-specific presser foot. The foot has deep-angled grooves on the underside that ride over the zipper teeth and help hold them upright during the stitching process for close-to-the-coil sewing. This is the secret to a successful invisible zipper application. Sew over piping and heavy cords with ease! The tunnel groove on the foot keeps the trim where you want it, allowing you to straight stitch it into seams with ease. Sew along side the cording with the trough on the underside of the foot holding the cording in place. The large groove under the foot allows lots of room for piping or whatever to travel through, and is available in 1/8-inch, 1/4-inch, and 1/2-inch cord widths. 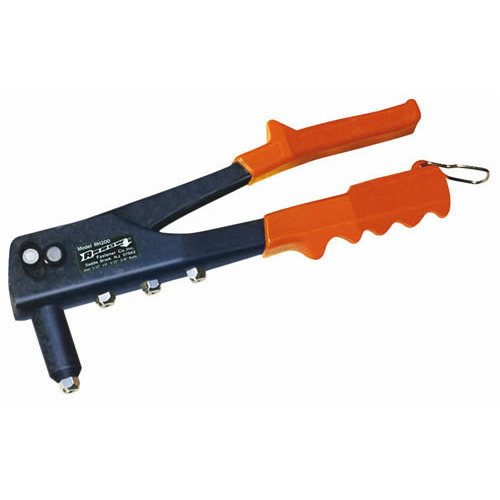 Pop Rivet Gun – Using a head rivet tool will allow you to install metal rivets to any project, make repairs and replace old worn out rivets. 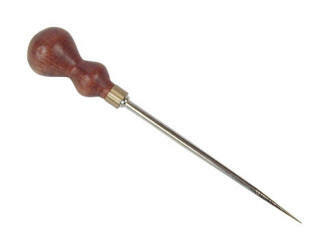 They can secure any hardware or any other material where a rivet is needed. Using this tool is as simple as squeezing its trigger, and following the manufacturer’s directions to ensure a proper attachment. Rivets are made from aluminum, steel, and copper; and are available in flat head, countersunk head and modified flush heads. Rotary Cutter – A rotary cutter is a tool generally used by DIYers to cut fabric. 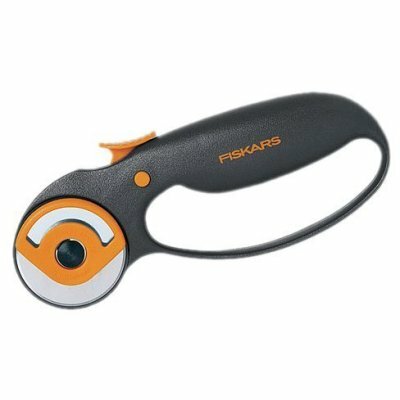 It consists of a handle with a circular blade that rotates, thus the tool’s name. Rotary blades can be found in different sizes and are used with a metal straight-edge to cut to straight lines of non-fraying materials. Several layers of fabric can be cut simultaneously, making it easier to cut out patchwork pieces of the same shape and size than with regular scissors. In conjunction with a rotary cutting mat – specially designed to be used with a rotary cutter, and made of thick and resistant plastic – it is also a practical tool for achieving the straight, squared lines that are so important in bag design. Awl – A awl is a simple tool with which holes can be punctured in a variety of materials, or existing holes can be enlarged. It is also used for sewing heavy materials, such as leather or canvas. It is a thin, tapered metal shaft, coming to a sharp point, either straight or slightly bent. These shafts are often in the form of interchangeable needles. They usually have an eye piercing in it at the pointed end (as opposed to normal sewing needles) to aid in drawing thread through holes for the purpose of manual lockstitch sewing, in which case it is also called a “sewing awl”. The action is likened to that of machine-stitching. Compass & Dividers – A compass/divider set is a technical drafting instrument that can be used for inscribing circles or arcs. As dividers, they can also be used as a tool to measure distances, in particular stylelines for equally-spaced stitching . 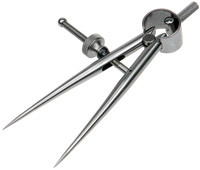 Compasses are usually made of metal, and consist of two parts connected by a hinge which can be adjusted. Typically one part has a spike at its end, and the other part a pencil. Circles can be made by fastening one leg of the compasses into the paper with the spike, putting the pencil on the paper, and moving the pencil around while keeping the hinge on the same angle. The radius of the circle can be adjusted by changing the angle of the hinge. Distances can be measured on a bag design using compasses with two spikes, also called a”dividing compass”. The hinge is set in such a way that the distance between the spikes on the project represents a certain stitch length or spacing, and by measuring how many times the compasses fit between two points on the seam the number of stitches and spaces between those points can be determined. Grommet Pliers – Grommet pliers are designed to insert the metal ring known as a grommet or eyelet that allow a drawcord to pass through. 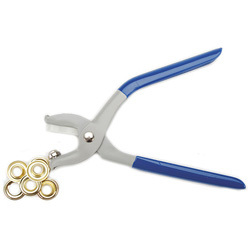 These pliers work similar to a paper hole puncher, except instead of removing an object, they install grommets to help increase the function of the style and prevent wear-and-tear. Chalk Wheel — a chalk dispenser with a rotating wheel, makes fine precise lines. Chalk powder is available in different colours. Always test to be sure the chalk will brush off before using it on the face side of the bag design. There are many occasions when handling leather that you need to thin it down, making buttons, trimmings or just to decrease the thickness of a fold. To do this you need to skive it on the back. This knife makes a remarkably accurate, fast and easy job of skiving leather. 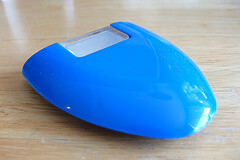 The remarkable tool is fitted with special razor blades, which are available separately in a dispenser. 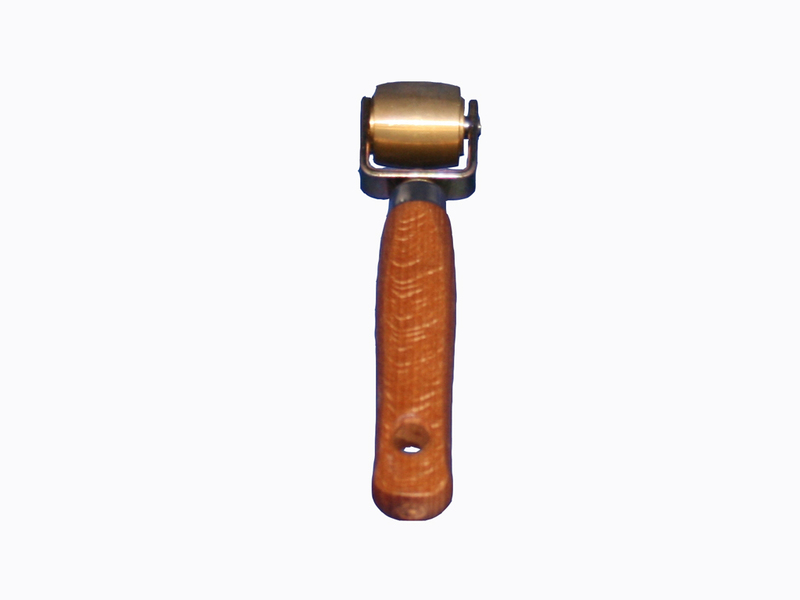 Seam Brayer – A narrow soft rubber or nylon brayer, much like a hand roller to roll out ink for printing or applying wallpaper. Designed to offer every advantage, these soft hand rollers feature a durable plastic comfort grip handle, heavy duty steel frame to eliminate warping and a precision ground finish. The roller has a 20-durometer hardness to assure even seaming of non- heat pressed materials such as leather, vinyl, and plastics. Often it use used in conjunction with a rawhide mallet to flatten seams.